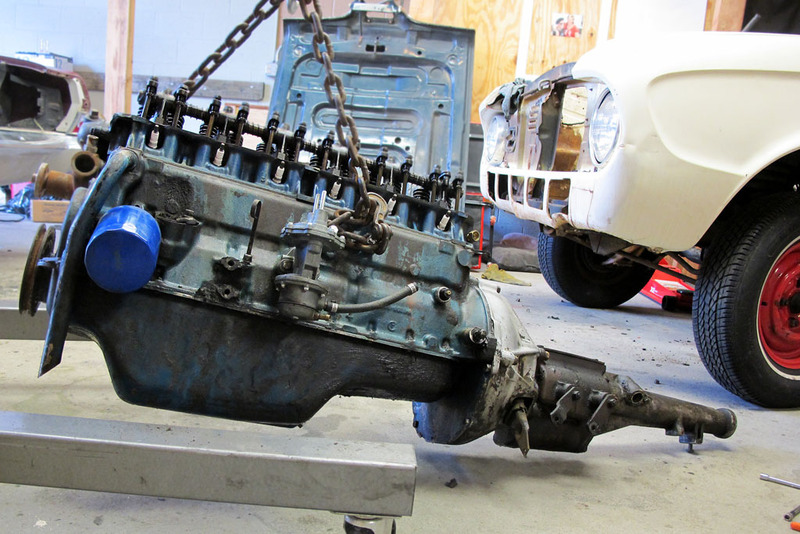 The last time you heard about the Ford Falcon project, I was getting everything off the engine in order to pull it… that was nearly a year ago! In between here and there you’ve hardly heard from me. It’s been quite a year – not only did I start a new job (in which I’m writing articles every day), I got married, and moved. 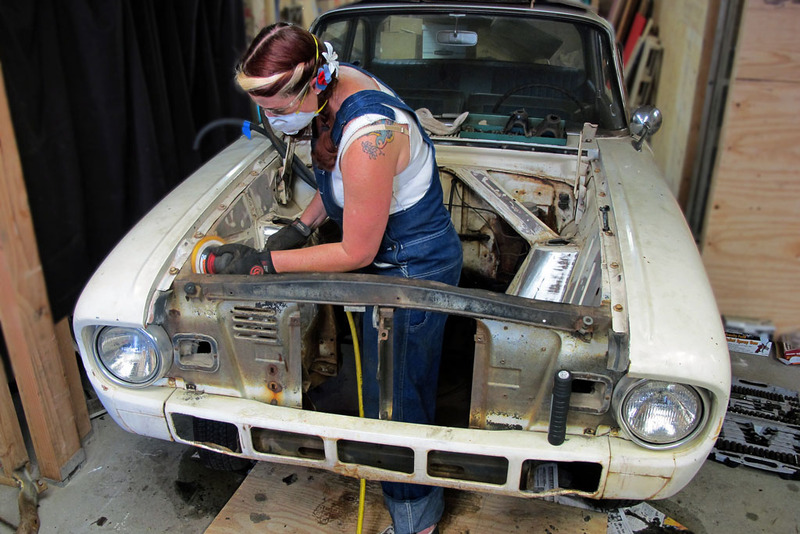 Those things haven’t kept me from the garage though – I helped build a demolition derby car with my car club and also took part in my first SEMA build project with the SEMA Businesswomen’s Network. I can only make excuses for so long though – and the time has come to follow through with the Falcon. In bits and pieces over the past few months, the engine has come out, I’ve done my first bits of body work using hammers and dollies, and I’ve sanded the engine bay. Originally, this was to be a quick job – sanding just enough to lay some rough paint down. 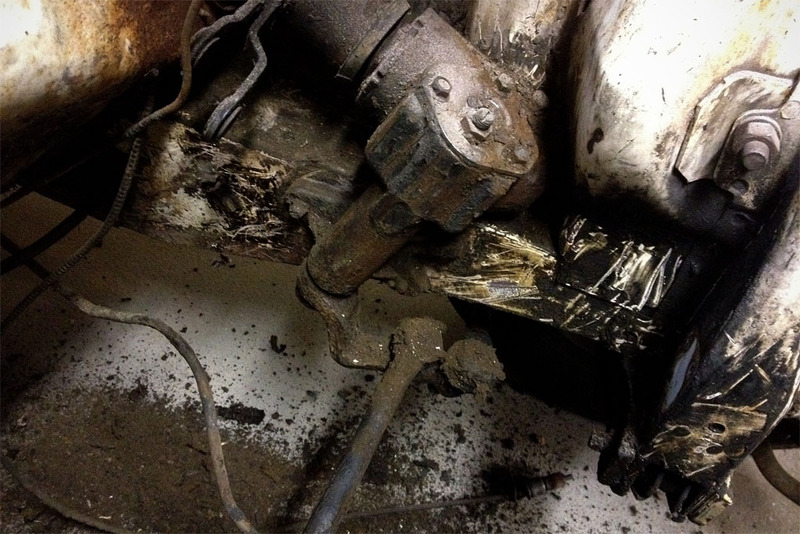 Well, the moment that Chicago Pneumatic sander uncovered bare metal I just had to keep going. 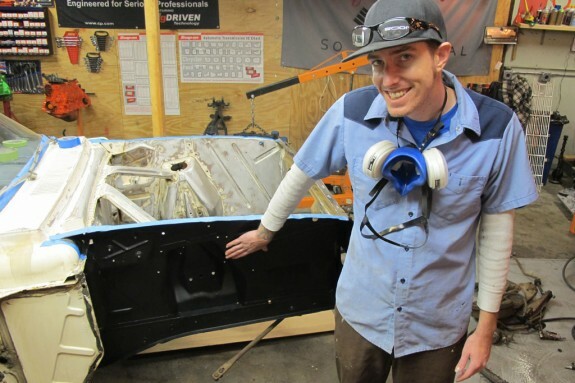 The project was progressing little by little – all the while I had a tentative plan to finish it in time to drive it to the Mooneyes Xmas Show on December 8th. Finally, last weekend we decided to really commit to getting it done (my husband is my partner in crime with me on this one…although he still doesn’t lay a hand on my Studie!) 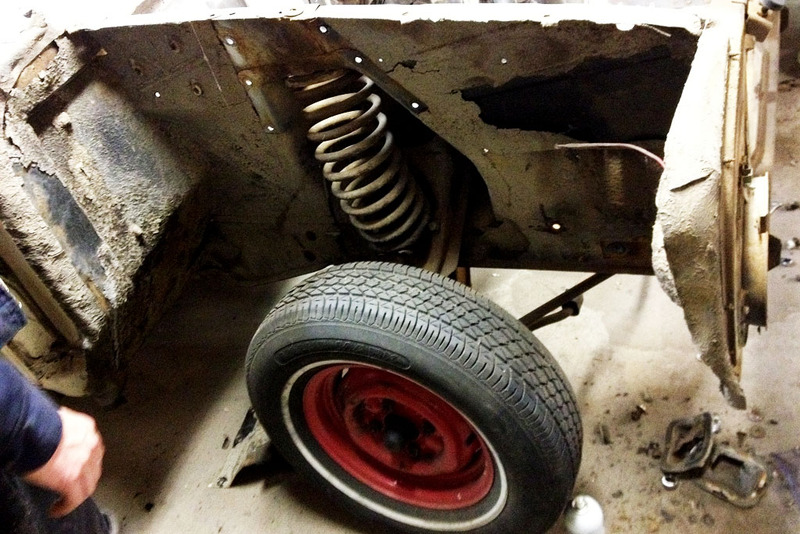 Just as I was wrapping up the last bits of my sanding he convinced me to remove the front fenders. 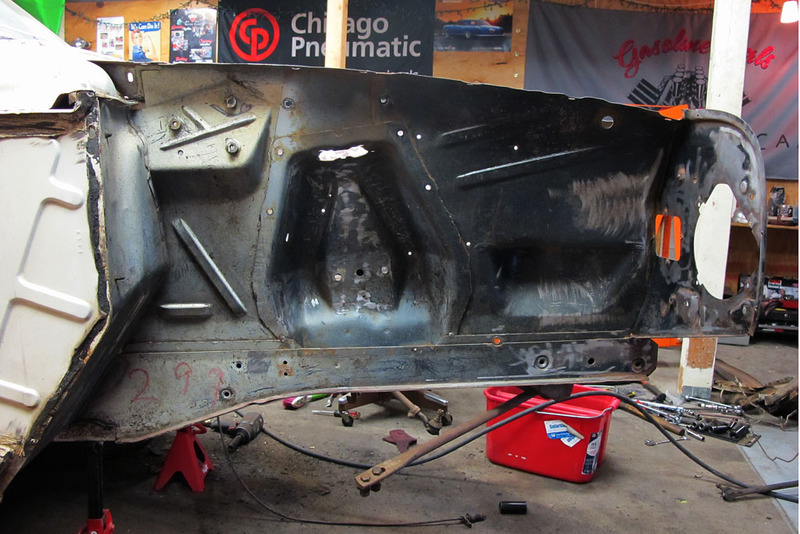 We’ll be painting not only the engine bay, but also the hood – and removing the fenders will give us a much better look when we’re done. Underneth the fenders was a whole other can of worms. Some of the undercoating had already been knocked off, and what was left had extra layers of mud over it. So that had to go. This is my new husband and co-mechanic Ethan. As the project has progressed, it’s mostly seemed like we were working further away from our goal of having it done for Mooneyes. But we’re determined… if we don’t make it, at least we’ll have tried. And certainly this project has risen to a level not planned for when it got started. We’ve only got 10 days to go, and each one of those you’ll be getting a brief update on our progress. Having you all plugging for me will help – keep an eye out, and you can also follow me on Instagram under “greasegirl”. Here’s all the posts for our mad thrash! #7 Unmasked and looking good! Looks good, what I can see. A bare-metal engine room would be awesome. I’m disappointed you didn’t drop in a 300 cube truck motor though. However, that’s your ride and not mine. I hope you two can get it all done before the deadline. Colour will be?… Good Luck, don’t look back.